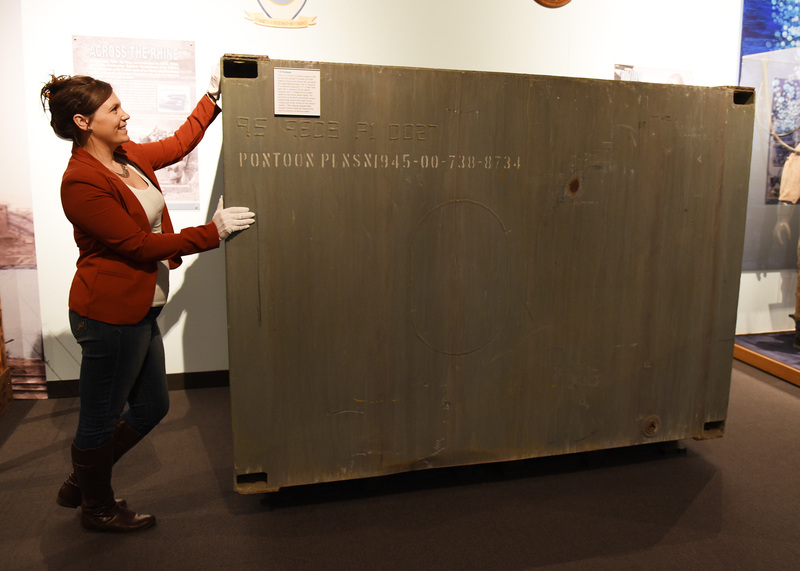 U.S. Navy Seabee Museum Curator Robyn King stands next to a pontoon, currently on display in the Atlantic Theater presentation in the museum, to demonstrate the size. Not only as a museum professional, but on a personal level, I am fascinated in any history that has incredible stories and holds interest in which I would like to gain knowledge so I may share it with others. 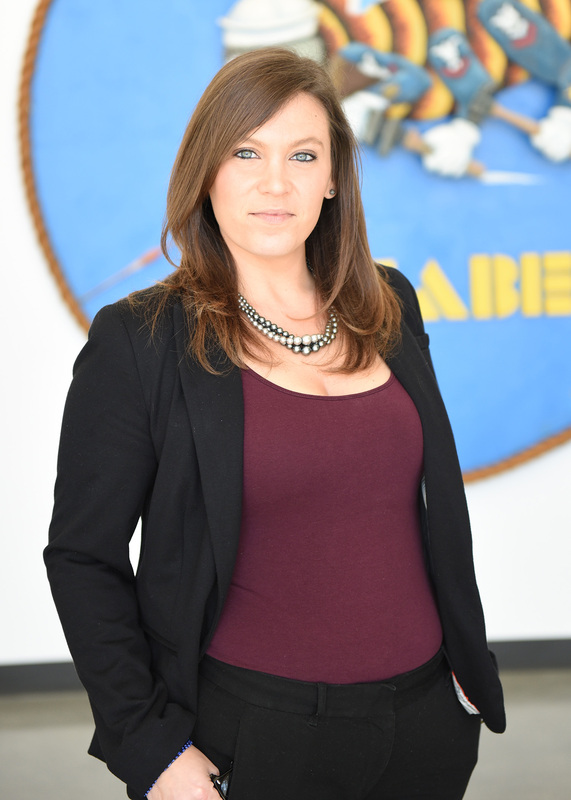 I am a museum curator; I want to show you the amazing history behind the Seabees! Over the next couple of weeks, we will share the incredible ingenuity and construction behind the concept “Ship-to-Shore.” Moving men, trucks, and all of their equipment off Landing Ship, Tanks (LSTs) onto land in the most efficient way possible – it’s quite ingenious. This week we’ll discuss the “secret weapon” of the Navy: pontoons. They came to be called “magic boxes” and were nothing short of a miracle. A simple steel box which helped lead the way to victory during WWII. By 1943 the U.S. was immerged in war on two fronts; the Atlantic and the Pacific. Thousands of men, trucks, armament, and equipment needed a fast and efficient way to offload from ships, most often under enemy fire. 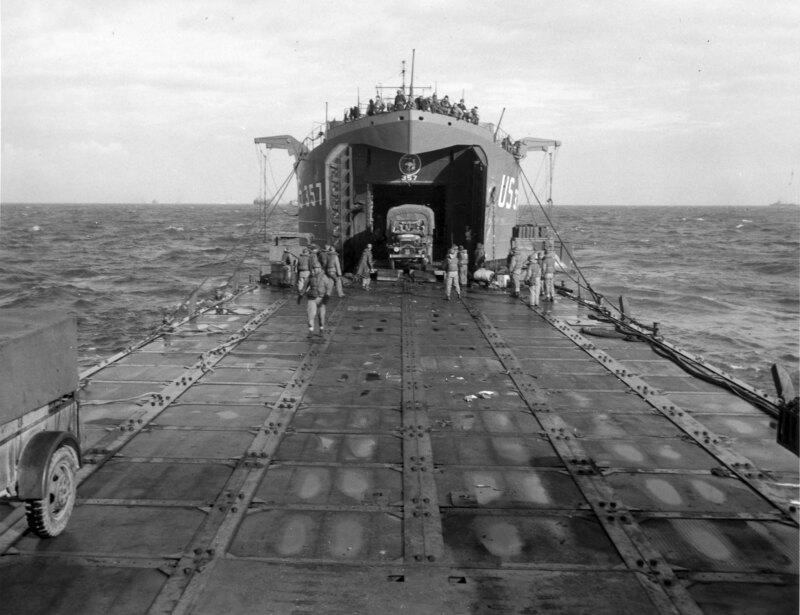 A frequent challenge surrounded the LST’s, which were vessels that could drive their ramps clear to a beach and offload machines with no time lost. Unfortunately, many of the LST’s were getting stuck in the water hundreds of feet before reaching the beaches causing equipment to drive off the ships and become submerged. The task of finding a solution to this dilemma was given to Capt. 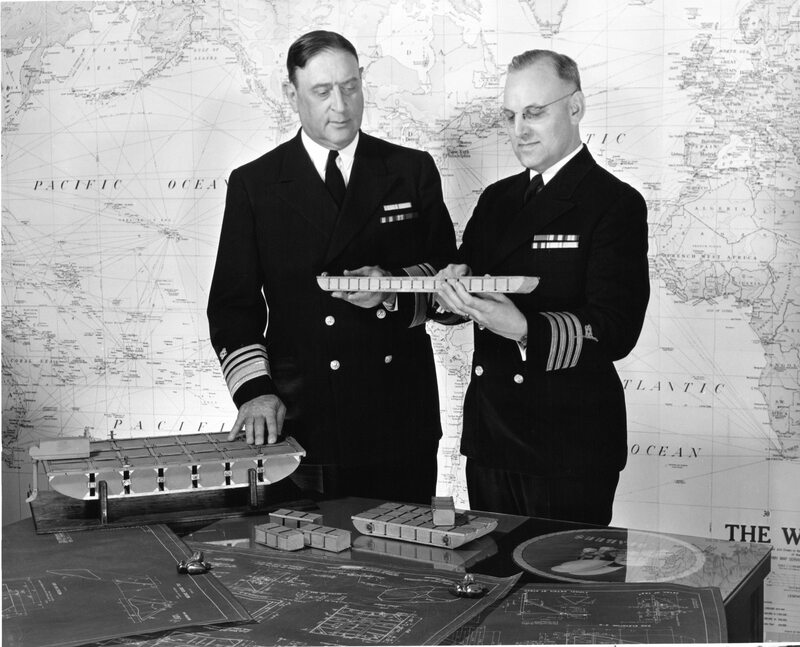 John M. Laycock, Naval Civil Engineer Corps, pictured above with Adm. Ben Moreell. He derived the idea of the “magic box.” He had discovered a way to string the 5 x 7 x 5 foot pontoon boxes together and keep them strung rigid and capable of sustaining great weight in a heavy sea. 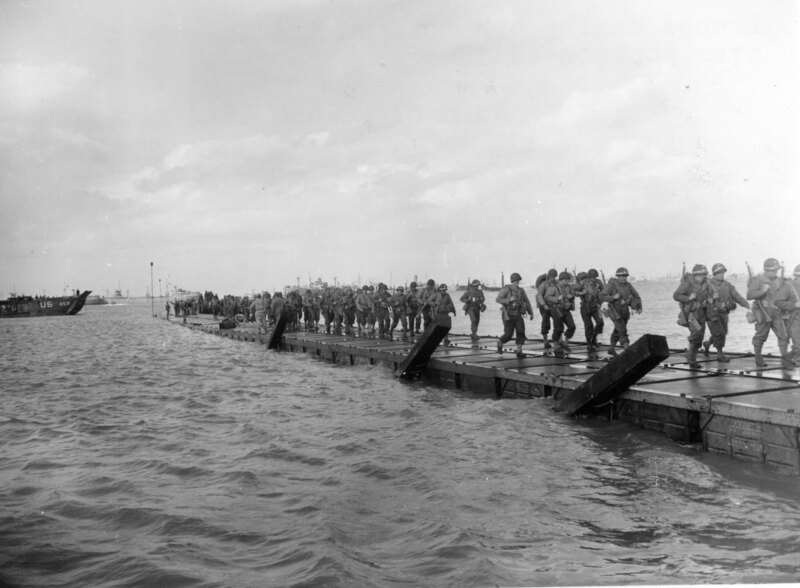 Placing two pontoons side by side and thirty deep, they strung together to create causeways which could attach to the LST’s ramp and offload thousands of men, trucks, and all their equipment to shore within minutes of landing. Seabees, whose jobs mostly consisted of land construction of airstrips, roads, and oil tanks, were then able to engage in sea operations. 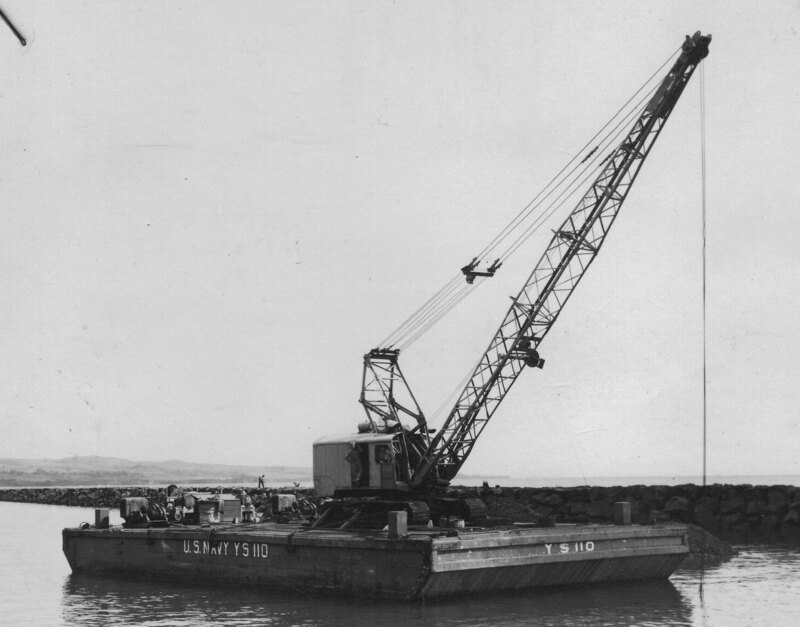 The Seabees were responsible for the operation of the pontoons and the transport of men and equipment from LSTs. What is fascinating about the concept behind pontoons is not only could they create causeways, but when fastened together in different capacities, they took numerous other forms! To name a few, pontoons could assemble into self-propelled barges also known as “rhino ferries,” floating dry docks, seaplane ramps, floating cranes, and pontoon bridges. New useful combinations were constantly being discovered and each combination contributing to the victory of the war. The creation of the pontoon was a large contributor to the success of D-Day on the beach of Normandy. Under fire from the Nazis, Seabees assembled sections of the pontoons to become piers which turned into floating roads for the fighting men and armored vehicles leading the beach attack. With the advantage of the Navy’s “secret weapon,” mobile bases could pop up and disassemble all over the pacific. In a war fought on islands from naval bases over long distances, pontoon structures like the floating dry docks could be assembled to assist the nearby raids. Troops could be readily supplied with food, Seabees would have their equipment, damaged planes and boats could be repaired, and oil rigs could be available. There was no end to the possibilities of these pontoons! 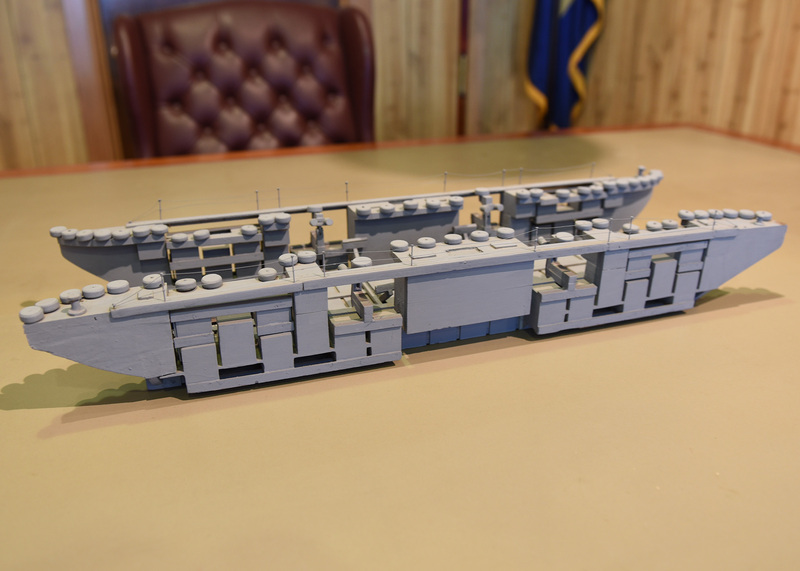 Desk model of a floating dry dock currently in the U.S. Navy Seabee Museum’s collection. It is intriguing to discover the Navy’s creativity designing and using these “magic boxes” as well as learning the role they played in the road to victory for WWII. Knowing something as simple as a steel box could be assembled into more intricate designs is one of the many characteristics of the Seabee culture we are passionate about sharing. This entry was posted in Curator's Corner, Seabee History and tagged CEC, Civil Engineer Corps, curator, engineering, learning, military history, museum collection, museum education programs, museums, national museums, Naval History and Heritage Command, Navy Heritage, Navy History, navy musuems, Normandy, ship-to-shore, U.S. Navy, US Navy Seabee Museum, US Navy ships, WWII, WWII atlantic theater. A little known great marine engineering achievement. Where can I learn about how the magic worked, the attachments? 64 Rhino Ferries were shared by British and Americans. In the four months from D Day they put ashore 93,000 units ( guns, tanks and vehicles) and over 400,000 tons of military stores, without which the venture would have failed.